In this article, you can read the comparison between two popular folding treadmills, Nautilus T618 vs Sole F80. Both of these models are foldable, meaning that you can just fold them when they are not in use to save some space. They are ideal options for small homes. So, which one does give a better value for the money? The first thing that we are going to compare is the dimensions. If you are looking for a folding treadmill in order to save some space in your room, then it should be compact and lightweight so that you can easily fold it and store it. See also: Nautilus T618 vs T616. Nautilus T618 is generally smaller and lighter. This model measures 72.5 inches long, 35.25 inches wide, and 57.75 inches high. So, this model will take less space of your room. If you are really worried about the available space in your home, then this model is probably a better choice. Nautilus T618 is also a little bit lighter than Sole F80, so it should be easier to fold and unfold. Sole F80 is larger and heavier. This model measures 82 inches long, 37 inches wide, and 57 inches high. It is going to take more area of your room. However, if you actually have enough space for it, then this model remains as a viable option. Note that this model is a little bit heavier. The next thing that you should consider when choosing between Nautilus T618 vs Sole F80 is the build quality. Well, indeed, both models are well built. In general, they are both very tough and durable. Their decks and frames are able to hold users of up to 350 lbs, so they are suitable for most people. Nautilus T618 has a sturdy and tough frame. However, unlike the other models in the series, this model comes with a more advanced deck, which features the rebound cushioning system for the best comfort and performance. This deck provides very soft landing and also promotes strong kicking. As the effect, your feet and joints will not get sore because of impacts, and you will find it much easier to run on the treadmill. The deck is also really durable. The running area of Nautilus T618 is 20” x 60”. This is pretty much standard. It already allows most adults to run comfortably. Sole F80 has a precision-welded steel frame with an epoxy powder-coated finish. The construction seems to be really tough, and the finish makes it easy to clean. Note that the finish doesn’t seem to resist scratches very well. 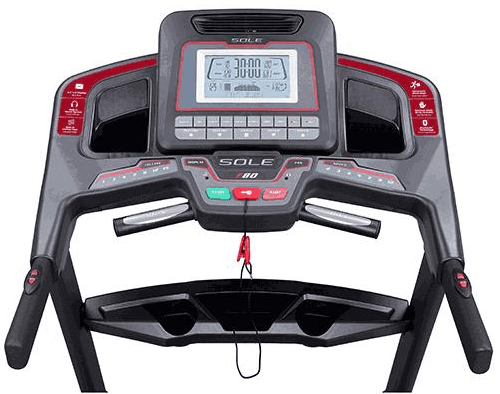 This treadmill is equipped with the Cushion Flex Deck which provides excellent shock absorption to reduce joint stress. The deck is awesome; it has been shown to reduce impacts by 35% – 40%. Your feet will love it very much. The running area on Sole F80 is slightly larger. It measures 22” x 60”. The extra width will make it more comfortable, especially for people with large physicality. In terms of performance, Nautilus T618 vs Sole F80 are mostly similar. Both of them are powered by 3.5-HP motors which allow speeds up to 12 MPH. Both models are ideal for casual home users who only run occasionally as well as enthusiasts who want to train at home. However, professional runners should look for a more powerful model. Both models are equipped with 2.75-inch rollers, which ensure smooth performance and quiet operation. Their rollers work very well, as they are not noisy at all. Both models also operate smoothly. Even when changing speeds, they transition quite smoothly without abruptly vibrating like cheap treadmills do. 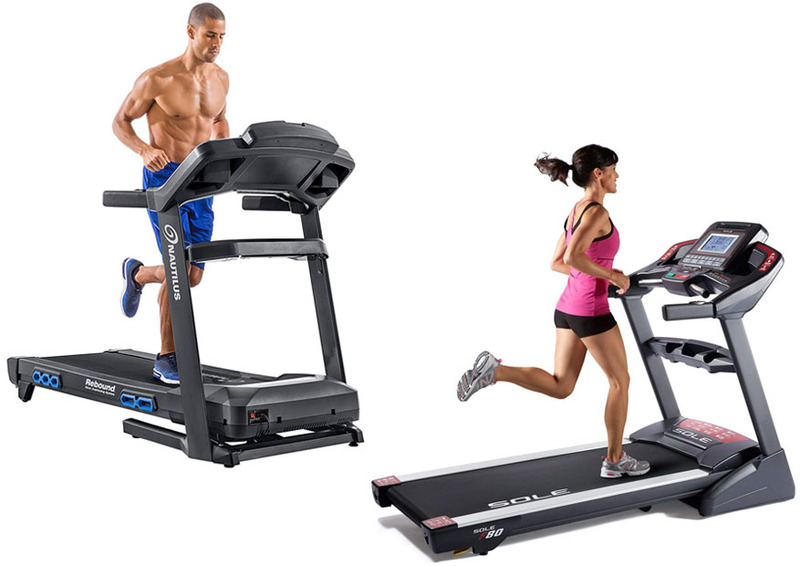 Both models are also capable of several incline levels. The maximum incline level is 15%. You can adjust the incline to simulate an outdoor terrain. It is great for adding some variation to your workout. Nautilus T618 features a USB charging port for your mobile device. There are also built-in speakers and an audio input port so that you can play your music while running. This model has built-in Bluetooth to connect to your mobile device wirelessly in order to sync with your fitness tracking app. In addition, Nautilus T618 can sync with the free Run Social mobile app, which can simulate the terrain of a real location on the treadmill. There are 27 routes from 19 locations available. The mobile app also allows you to run with other people in real-time. 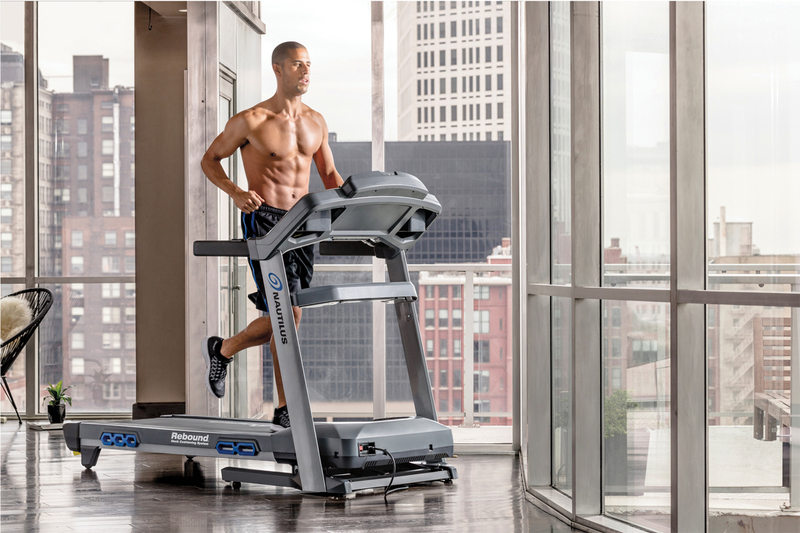 The treadmill itself comes with 26 built-in training programs. There are training programs that are specifically designed for weight loss, cardiovascular endurance, and interval training. Sole F80 doesn’t have a USB charging port. However, it does have built-in speakers, an audio input port, and a headset output port. So, you can play listen to your favorite music while running. It also has Bluetooth to sync with your fitness tracking app. There are 10 built-in training programs in Sole F80. They are designed for weight loss, muscle toning, and cardio training. You can create up to two user profiles to save the workout routines and recorded data separately. Nautilus T618 is backed by a decent warranty. Both the frame and the motor are covered for 15 years. The other parts are covered for 5 years, and the labor is covered for 2 years. The warranty is definitely good even though it is not as great as Sole F80’s warranty. Sole F80 comes with an even better warranty. It provides a lifetime warranty which covers the motor, frame, and deck. However, the other electronics, rollers, and wear components are also covered for 5 years, and the labor is also covered for 2 years. In general, Nautilus T618 is more recommended. This treadmill has a smaller and lighter design, so it is more space-friendly. It has excellent build quality and performance. It comes with better features, including a USB charging port, Bluetooth, compatibility with various mobile apps, and 26 built-in training programs.